On 10th August, Cooking Vinyl will release The Proclaimers’ first album since 2015’s Let’s Hear It For The Dogs. 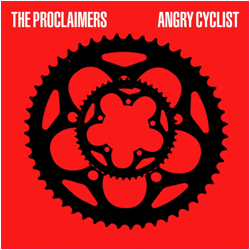 Angry Cyclist finds The Proclaimers at the peak of their songwriting prowess. Instantly catchy hooks and melodies, trademark close harmonies, moving, as well as clever and subtle, biting lyrics, great arrangements with production by Dave Eringa. They’ve also crafted a video to go with the release. Conceived and directed by Rianne White and set in a dystopian world, the video expounds on the message in the song – a dark interpretation of angry cyclists plugge dinto a machine and overloaded with evocative imagery of current and ongoing issues. Not the usual type of Sunshine On Leith cheeriness you’d expect from Craig and Charlie. The title track is also the first single. Strings soundtrack a song full of Craig and Charlie’s impassioned vocals and a lyrical metaphor about the reactionary and bigoted times we live in. Their sharp, coruscating and dry observations continue on songs such as Looted, a song about the theft of the British Empire, and Classy, which takes a wry look at the ludicrous strata of the British class system. The Proclaimers have always been politically and socially aware artists. On many of the Angry Cyclist songs they further skewer the hypocrisy and inequities that they see around them yet the album remains incredibly positive, hopeful and optimistic: the vitality and passion easily putting artists half their age, or younger, in the shade. Angry Cyclist will be available on CD, LP, digital download and streaming services. The Proclaimers are back out live from July through to December this year. As they head for a sell-out 47 shows in the UK, in Scotland they sold out 30,000 tickets in 20 minutes of going on sale. September sees The Proclaimers on a coast-to-coast 13-date tour of Canada.